LDUCZ-J7 What a dainty little specimen. Note the grubby scale bar. Maybe it’s time to make some new scale bars? 1) Trilobites and Ammonites. Trilobites and ammonites are probably the most well known invertebrate fossils and you’re likely to find both in most museums, geological fairs and fossil shops. After perhaps dinosaurs and mammoths, these invertebrates are synonymous with fossils and palaeontology. Why this may be is probably due to their recognisable anatomy, abundance in the fossil record and the fact that they are both animals which are extinct and somewhat alien. 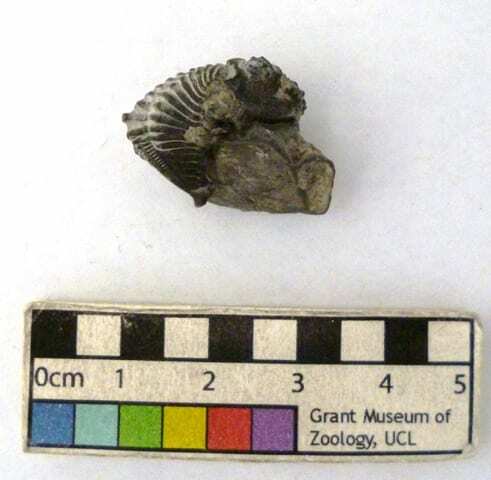 This trilobite is identified as Encrinurus punctatus and according to the label was excavated from the Wenlock Limestone, which occurs in Central England and the border of Wales. The Wenlock Limestone is 420 million years old and represents a rich ancient reef system inhabited by trilobites, snails, crinoids, nautiloids, bivalves, corals and sponges. 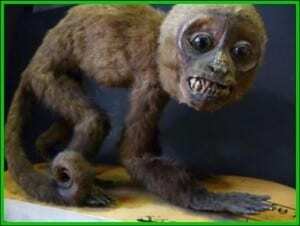 2) What kind of animal? There is evidence that trilobite fossils were known by the ancient Greeks and Chinese although they weren’t formally described as a distinct group and given the name trilobite until the 19th Century. The name trilobite refers not to the three head, thorax and pygidium sections but to the three lobes of the thorax with the central axis and the rows of pleura (the thing that looks like a spine and the ribby things) They were recognised as a kind of arthropod from their discovery but have been identified as insects, crustaceans and chelicerates (spiders, scorpions and their relatives) over the years. The current consensus is that they are most closely related to chelicerates but they are still commonly considered as their own distinct group of arthropods. Label for LDUCZ-J7 which reads: Enchrinurus [sic] punctatus Wenlock presnd by G.H.Fowler /XI/06. 3) Celebrated collector. The, sadly, torn label for this specimen records that this specimen was presented by G.H.Fowler in November 1906. It’s a fairly safe assumption that this is George Herbert Fowler who was an assistant to former Grant Museum curator E.Ray Lankester who you can read about in this blog post . In addition to teaching at UCL, Fowler was interim director of the Marine Biological Association and founded the Challenger Society for Marine Science. 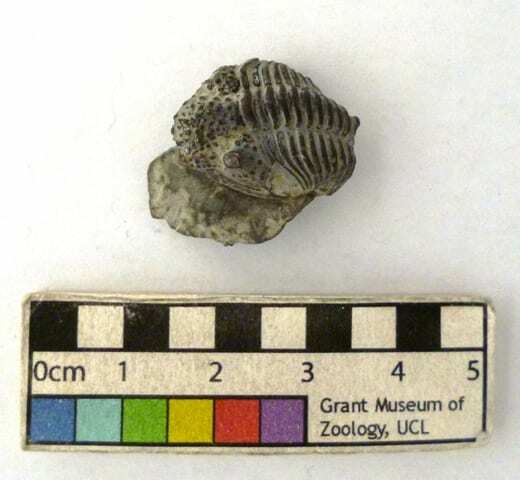 Fowler was primarily a marine biologist and after he retired became a historian and archivist so it’s not known if he collected this specimen on a fossiling jolly himself or bought it and then presented it to UCL. Side shot of LDUCZ-J7 showing semi-enrollment? 4) Keep Rollin’ Rollin’ Rollin’. This specimen is partially enrolled (curled up in a ball) around a piece of matrix. A number of trilobites have been found rolled into a ball (in a similar defensive strategy to hedgehogs, armadillos and woodlice) and it’s thought that this was a defensive mechanism, rather than an artifact of preservation. It’s not clear if this specimen is mid-enrollment or merely the result of being stretched and skewed into this awkward position, however, trilobites in the genus Encrinurus have been found fully enrolled. 5) Longevity and extinction. Being a trilobite was a very successful way of life, trilobites stayed around for a whopping 270 million years. Their appearance in the fossil record is used to mark the beginning of the a yet unnamed ‘Cambrian Stage 3’ some 520 million years ago. As a group they weathered a number of mass extinctions with only one order, the Proetida, surviving an extinction event in the Carboniferous. Eventually trilobites disappeared in the Permian period shortly before the end-Permian mass extinction AKA ‘the big one’. Why they went extinct after such a long and successful existence remains contentious but a combination of sea level change and the last order of trilobites occupying a shallow sea environment is thought to have backed them into a sad extinction.